A poster can be produced using a wide range of software, some more advanced than others, some allowing you to collaborate online with other users. If you need to print your poster for an exhibition as long as your chosen software can export your file as a PDF (Portable Document Format) the print unit will be able to print it for you. There is a wide range of software that will allow you to create a poster but we recommend the following. As with all software each has a learning curve and the more sophisticated the software the greater flexibility it will give you. Software is always a trade off between ease of use and functionality. There are several steps to bear in mind before producing your poster. Setting your document size. What size will it need to be printed? The standard measure for paper sizes in the UK is the ‘A’ format. A3 is twice the size as A4 which is twice the size as A5 and so on. If you are creating a poster that needs to be A1 (841mm x 594mm) setting your artwork up as A3 will be sufficient for it to print well without it pixelating. A3 is 420mm x 297mm. Content. It is advisable to collect all your information together before construction your poster. This includes text, images, graphics etc… Using standard file formats makes importing your resources in to your chosen design software easier. Text. Use a Word format .doc or .docx or a plain text file .txt. Graphics.Use PNG (Portable Network Graphics) files .png as they support transparency. File for print. Most printers, desktop, in-house or commercial will print from PDF. As long as the software you choose to use can export your final file as a PDF you will be able to get it printed. Think about the colours you use. Different colours provoke different emotional responses in people. Warm inviting tones can be comforting, blues and greens can be cold and a clash of very bold colour, reds and black can be intimidating. Fonts can also be used to distinguish different areas of text, add weight to sections and give a different feeling to the information. Think about the message the images you use convey. Do they set the right tone, illustrate the point, convey the message or create tension? Free websites where you can produce infographics. Useful to illustrate key points in your poster to make data/information easier to understand. 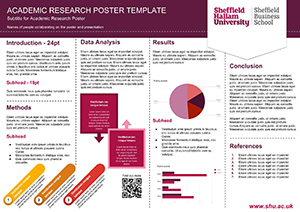 Save your final poster as a PDF so that it can be printed.